Established in 1969, Dynabrade Industrial Power Tools has been manufacturing unique, portable abrasive power tools and related accessories. With over 600 power tools in their product line, Dynabrade has been providing the automotive and industrial aftermarkets with high quality abrasive power tools. Canadian Motivel Inc. provides tools with professional distribution with customer service and assistance. We help you find the right tool for the right job. Teflon is called for when excellent release properties are required, or when high heat or chemical resistance is mandatory. Canadian Motivel Inc. distributes and converts the finest teflons on the market. 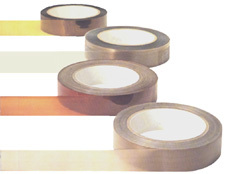 We sell slit rolls of tape, specialty cut-to-length pieces of tape or fabric. We also die cut specialty parts for your most demanding appllications.